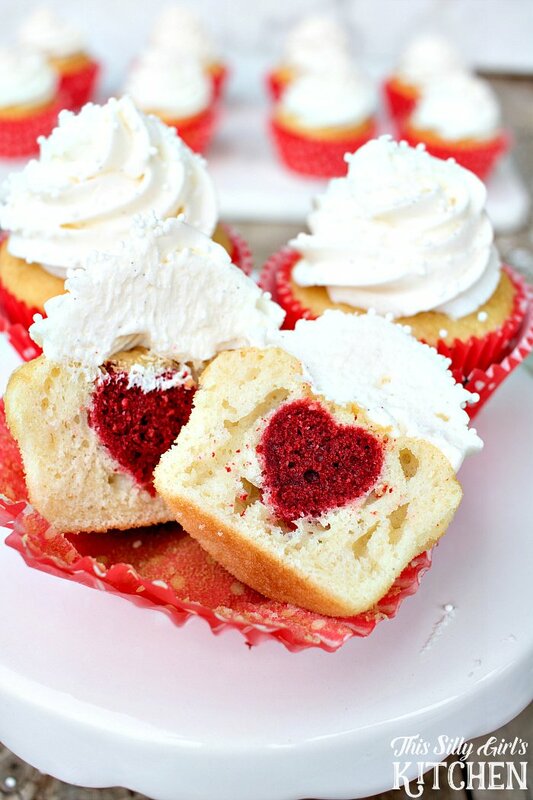 Surprise Inside Heart Cupcakes, vanilla cupcakes with vanilla buttercream frosting, with a surprise red velvet heart inside! Surprise! Looks complicated, doesn’t it?! Not at all!! 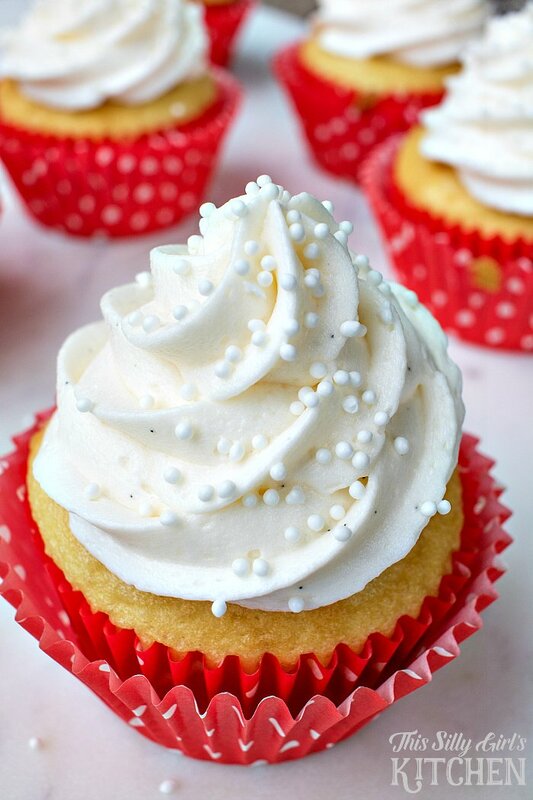 In fact, I even used boxed cake mix for these! Easy peasy, and delicious. 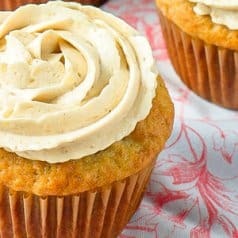 Topped off with the easiest homemade vanilla bean butter cream frosting and you are good to go! 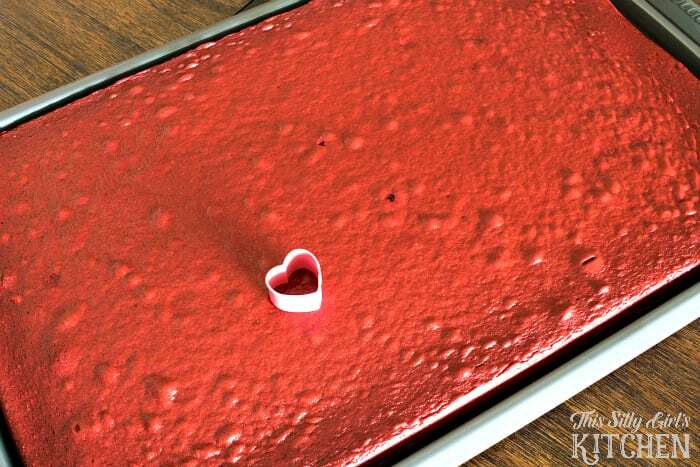 Place red velvet cake mix, 1 cup water, 3 eggs and 1/3 cup oil into a large bowl. With a hand mixer on low speed mix until moistened 30 seconds. Place on medium speed and mix for 2 minutes. 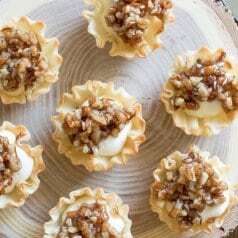 Pour batter onto a sheet tray lined with parchment paper, spread out evenly. Bake 20-24 minutes, until toothpick inserted in the middle comes out clean. Place on a wired rack to cool. When cooled completely, take a small heart shaped cookie cutter and carefully cut out 24 mini hearts and set aside. Place french vanilla cake mix, 1 cup water, 3 eggs and 1/3 cup oil into a large bowl. With a hand mixer on low speed mix until moistened 30 seconds. Place on medium speed and mix for 2 minutes. 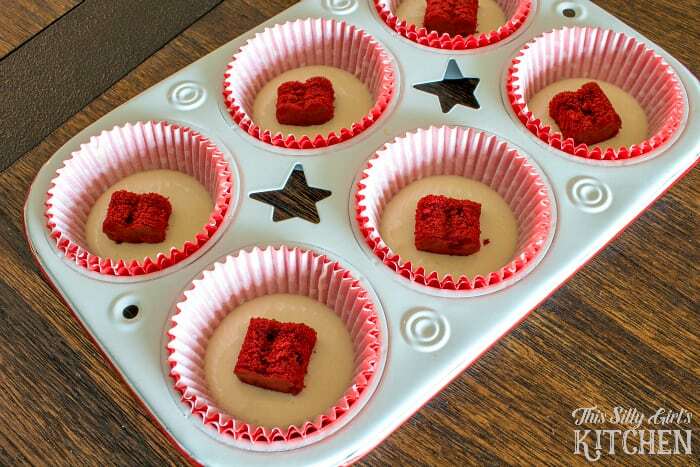 Place 1 Tablespoon of batter into lined cupcake tin. VERY GENTLY place a red velvet heart in the center, do not press down or you will have a circle, not a heart. Cover with about 1 Tablespoon of batter. Bake for 14-16 minutes, until toothpick inserted in the center comes out clean and they look done on top. Place butter and half of the sugar in a large bowl. Whip on high speed until sugar is incorporated. Add the remaining sugar and whip on high speed until light and fluffy, 3 minutes. Add in the vanilla, mix to combine. Add in half of the milk and whip until combined, add remaining milk if mixture is too thick. 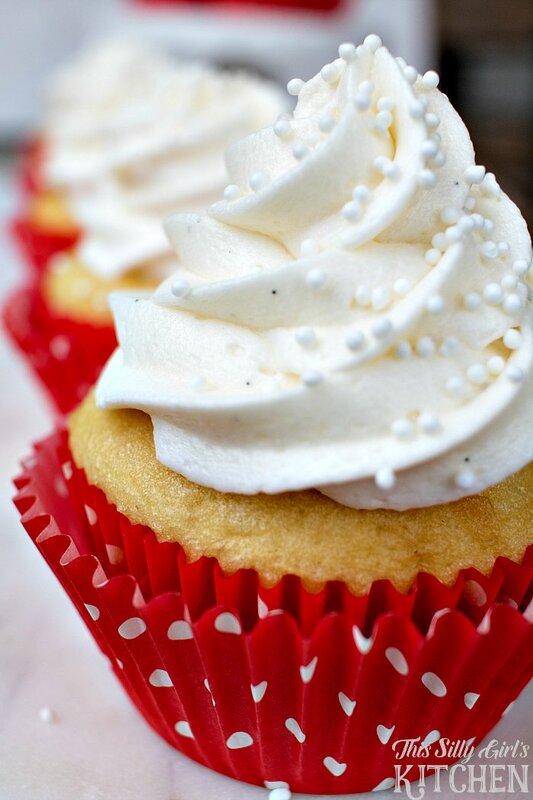 Top cupcakes with frosting (I used a large open star tip), decorate with sprinkles if desired, serve and enjoy! Yum! 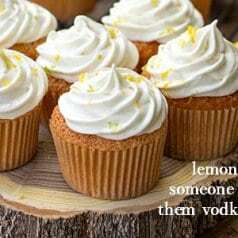 These would be so great for a class party or just because! 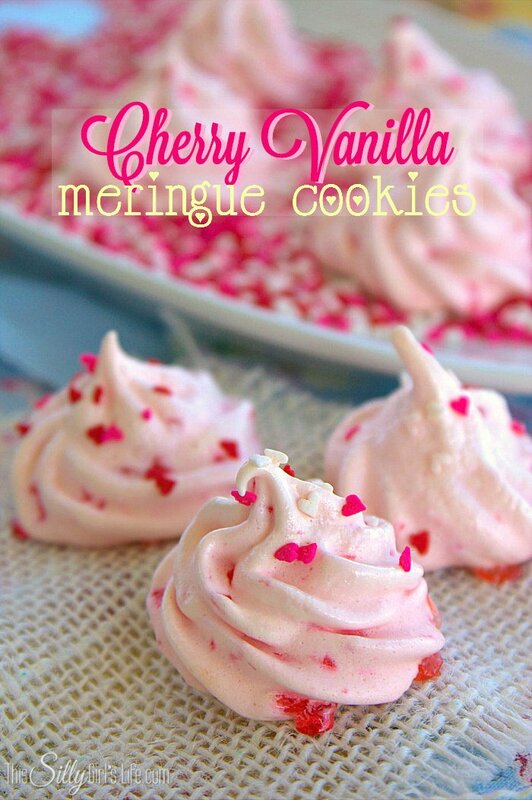 Looks adorable and not too complicated to try! Sweet! 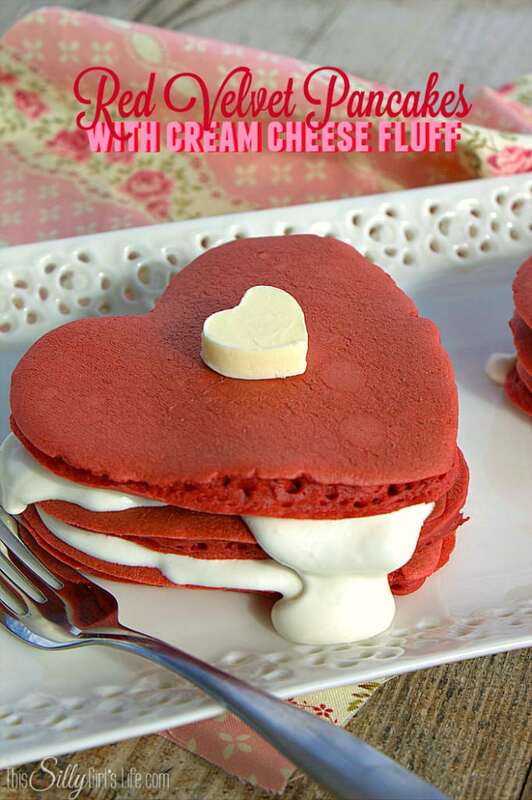 They r really looking yummm… and soo lovly.. Do the cooked heart shapped cakes harden when cooked again ? Nope, they are still soft! The cupcakes are beautiful. Red velvet is one of my favorite flavors. 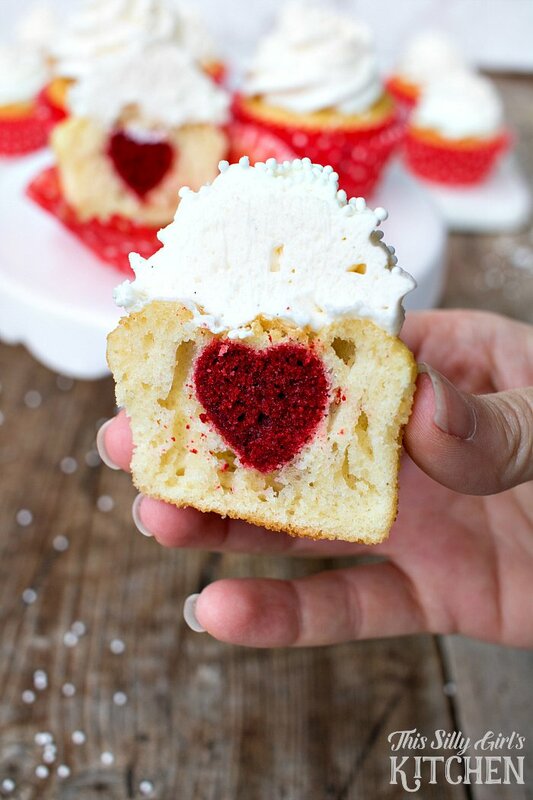 Love the heart cupckes. Saving this for Valentines Day !!! Thanks for sharing. These are adorable! Such a simple concept but it looks so great. I am pinning this for later! This is brilliant- and so pretty! Pinning! These are beautiful! 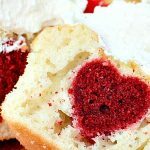 I’m glad you gave us the warning about not pressing too hard when we place the heart shape in the batter. I definitely needed that! So sweet! And just perfect to treat your loved one on Valentines day! I made these today, but for some reason only half turned out to where the hearts didn’t float to the top. Not sure why that happened. 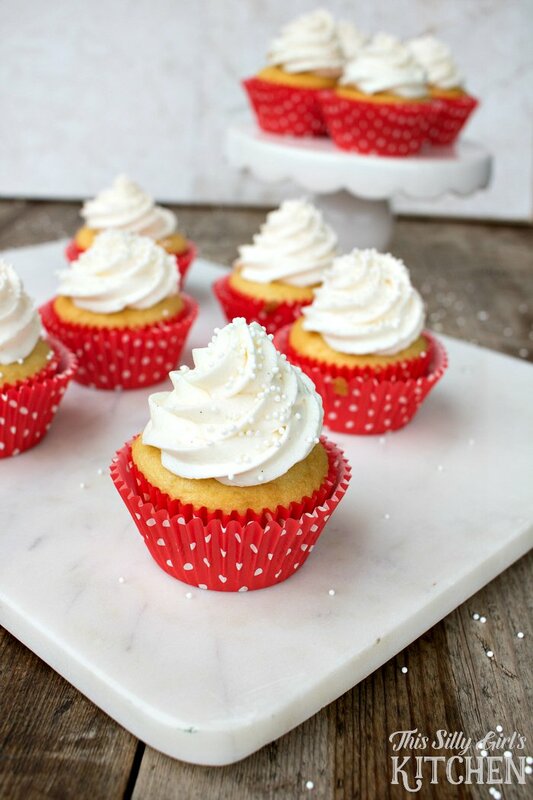 Did you use regular sized cupcake pans? Also, what size sheet pan did you use? These are probably the coolest things I’ve ever seen. My kids would be so excited to see the cute heart in the middle! 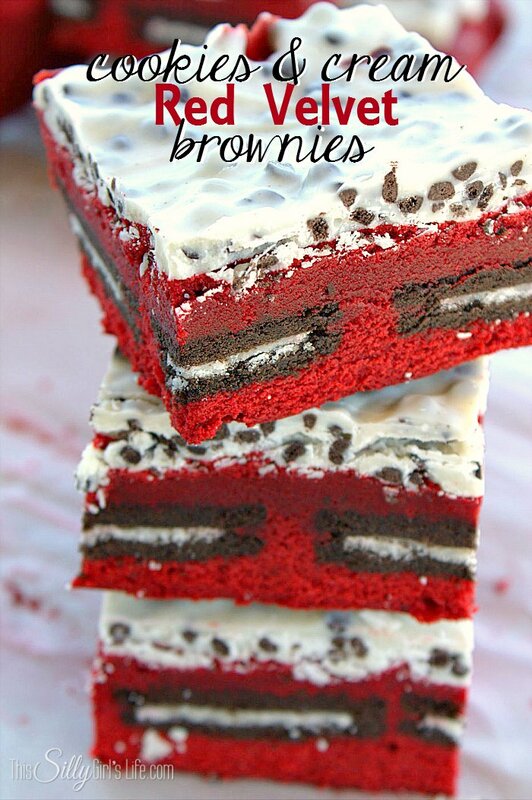 I’ve got to make these! It was in a pack of four cookie cutters, I got it at a craft store. I’m sure they still have some similar. What size sheet tray did you use or recommend for the cake for the cut outs? Going to try these for my son’s birthday with his first initial in some and age in others.